Infrared test of an unconverted Sony α6000, using a 720nm filter. I have been engaged in infrared photography since 2010. At that time I was using both B&W film and digital, as the Panasonic LX3 I had was capable of shooting handheld with an infrared filter attached; after the unfortunate accident of the Panasonic, I was using film exclusively. The Sony α37 I had was in no way capable of shooting in infrared -as most cameras nowadays, the result seemed more like a bad B&W photo- and because of that, I thought that the α6000 would also produce unusable results. 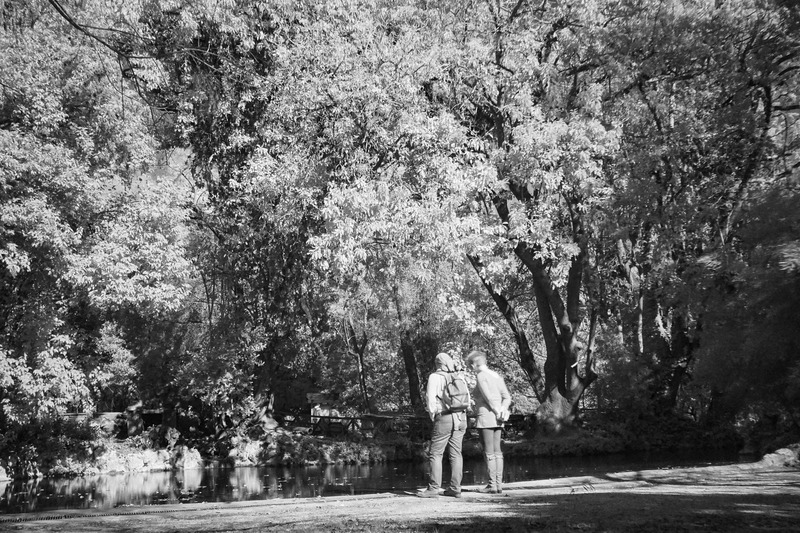 Nevertheless, I did a quick test one day and to my surprise, I found out that it can actually produce the infrared effect, albeit with the limitations of an unconverted camera (long exposure, hotshot with some lenses etc). I wanted to do a proper test, so I went to a park and took some photos in spots with a lot of trees, using an old manual lens for the Minolta SR system. Regarding the photo in the article, this couple stopped by the pond, as I was doing my trials and they actually stood almost still for the 10 seconds that the exposure lasted; just for this reason I present the photo here. The final verdict of the infrared test: Although not perfect, it is an option to engage more actively in digital infrared photography again.